The Delta PMH series is specifically designed for household electrical appliances with safety approvals including IEC/EN 60335-1 and IEC/EN 61558-2-16. In addition the product meets the EMC approvals to EN 55014-1 and EN 55014-2 for household appliances without extra EMI filter required. Available in, 50W, 100W and 200W versions, they also has a wide operating temperature range of -30°C to +70°C. 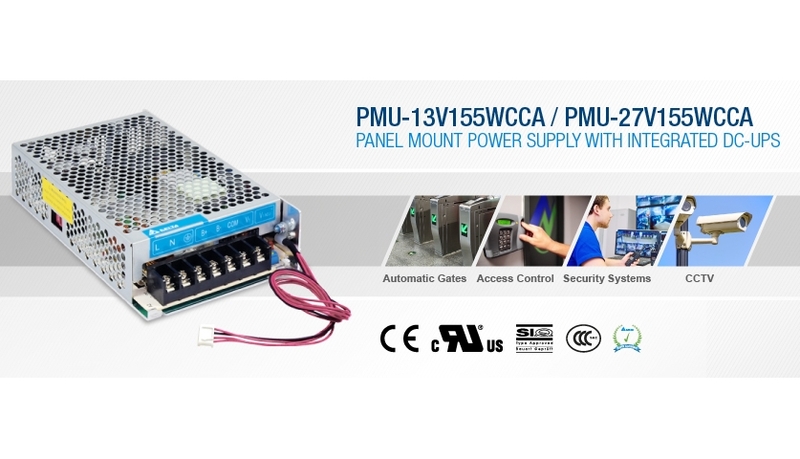 The PMU Series are designed to operate with an external 12Vdc or 24Vdc SLA sealed lead acid battery. The integrated UPS DC voltage provides battery management for charging and has TTL compatible monitoring signals for AC OK, DC OK and Battery Low status alert. The power supply utilizes MOSFET to switch to battery operation with zero switch-over time in the event of failure/ disruption of the input AC power source to ensure utmost reliability in your system protection. The first two models in the PMU series are rated at 13.8V/9.5A (PMU-13V155WCCA) and 27.6V/4A (PMU-27V155WCCA) with adjustable charging current from 0.5A to 1.5A. The convection-cooled power supply has a wide operating temperature range from -20˚C to +70˚C. For extra protection, the series features protection against reverse polarity for battery connection to prevent accidental damage to the power supply. They meet major international safety approvals according to IEC/EN/UL 60950-1 and CCC to GB4943.1, certified to EMI Class B to EN 55022, EN 55032 and GB9254.1. The series is suitable for alarm systems, access control, automatic doors; and other similar systems.